Discussion in 'MultiTools and Other Pocket Tools' started by DeepBlue, Jul 20, 2014. 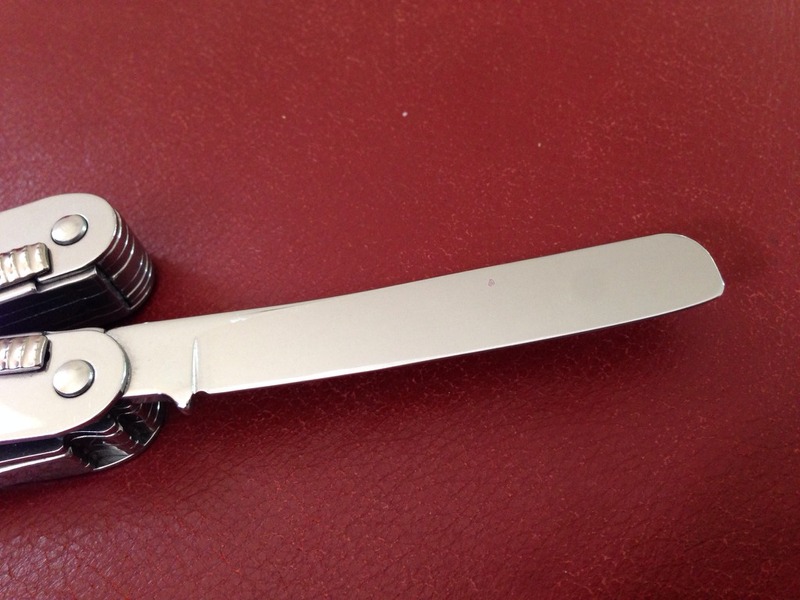 The really polished blade allows it to be cleaned quickly. Not really much to show. The sharp edge and serrations were ground away with a flat Dremel grinding wheel then the edge rounded and polished very smooth with abrasive paper and pads. The edge is completely smooth and blunt. Impossible to cut anything. I was a bit nervous taking a grinder to the blade but I'm very happy with the result. The 'no-knife' Spirit is now more versatile for my needs and much easier to show it's a legal carry. I also tend to carry a UK legal pocket knife when appropriate and prefer a simple knife so no loss of utility. MrUnderhill, murrydan, reppans and 13 others like this. Nice mod, and nicely done too! Sent from Catherine's iPhone using Tapatalk. A "spatula" and a "smooth spreader/applicator" is kinda the same thing, but I like it, nonetheless. The two different angles on the ends(corners) of the spatula are very similar to two of the angles of a caulk spreader tool I have. I'm going to watch this thread a while and see if any other great uses pop up. then I may do the same thing to mine. I carry dedicated folders for different jobs already so the blade on the Vic won't be missed. MinistryOfTruth, Nick4305 and ManVsLawn like this. I was thinking spatula in the sense of a mini spoon for powders. For, cooking, yes, they are spreaders! MinistryOfTruth, ManVsLawn and SAKplumber like this. A problem we have here in the UK is that locking knives on multi-tools are not EDC legal. 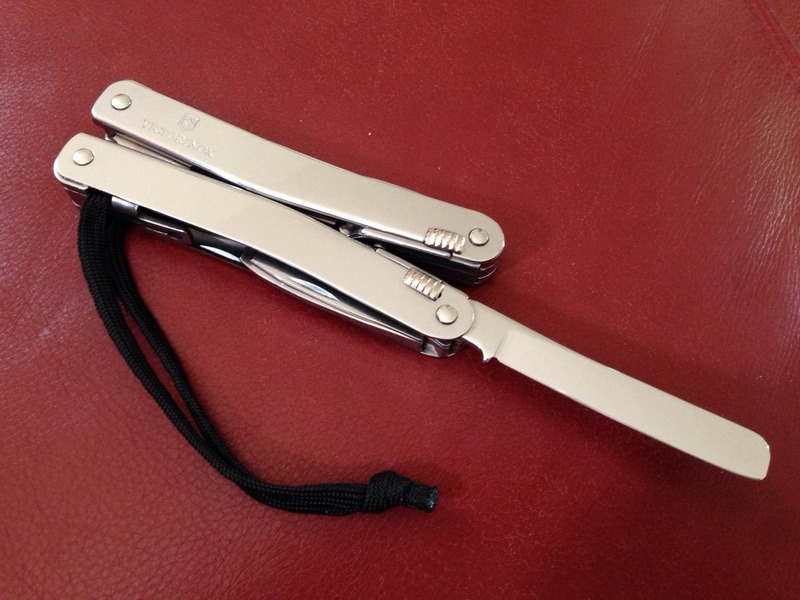 For most practical purposes a multi-tool with locking blade(s) is extremely unlikely to get you into trouble in the UK. They are obviously designed for constructive rather than destructive purposes. The rationale behind UK offensive weapons law is to prevent the use of knives in violent crimes such as mugging or gang fights. Not many violent criminals carry multi-tools. I 'd hazard a guess and say that it is extremely unlikely that a prosecution would proceed in the slim chance of such a tool coming to the attention of the police. Obviously common sense must prevail as to when and where and how you carry it. MangeD700 and SAKplumber like this. I really didn't intend to start a debate on UK knife law (it's been done a few times before). Just to explain my own discomfort and I though others might find this approach of interest. I don't really need a knife on a multitool so I felt that this is a useful, versatile alternative. Works for me. MangeD700, SAKplumber, FL Woods Bum and 2 others like this. Nice job there. Peanut butter speader, that's what I would use it for. SAKplumber, DeepBlue and FL Woods Bum like this. A most natural solution for making a knifeless multitool!